Billiards - Major William Broadfoot 1896 - Longmans, London and Bombay - Number 193 of 250 Large Paper Deluxe Edition	A handsome copy of this large and comprehensive limited edition, an informative history and guide to the game of billiards, with contributions by A.H. Boyd, Sydenham Dixon, W.J. Ford, Dudley D. Pontifex, Russell D. Walker, and Reginald Rimington-Wilson. Illustrated with eleven full page black and white plates by artist Lucien Davies, and numerous drawings and diagrams throughout the text. From The Badminton Library Sports and Pastimes series. 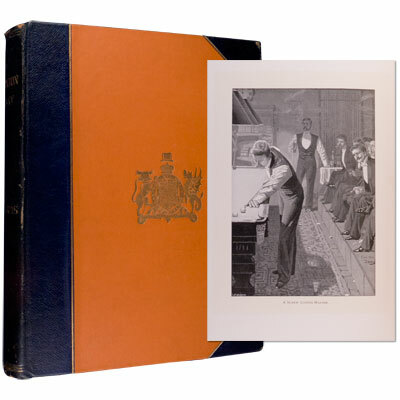 The library was published in three different formats, the Standard trade edition (octavo, bound in brown illustrated cloth), the Deluxe edition (octavo, bound in half blue morocco, gilt titles to the spines and bright orange boards with a gilt coat of arms to the upper board, top page edges gilt), and this large paper deluxe edition (large octavo or quarto, a limited edition of only two hundred and fifty copies, bound in half blue morocco). The name 'Badminton Library' was derived from the Duke of Beaufort's family house, Badminton House in Gloucestershire in the United Kingdom. In the second half of the 19th century, the sport now known as badminton was gaining popularity. It was also played at Badminton House and referred to as "The Game of Badminton," however there is no individual volume dedicated to the sport in the series. Major William Broadfoot (1841-1922), Royal Engineers.